In this tutorial, you'll learn what Markov chain is and use it to analyze sales velocity data in R.
In order to have a functional Markov chain model, it is essential to define a transition matrix Pt. A transition matrix contains the information about the probability of transitioning between the different states in the system. For a transition matrix to be valid, each row must be a probability vector, and the sum of all its terms must be 1. This tutorial will also cover absorbing Markov chains. These chains occur when there is at least one state that, once reached, the probability of staying on it is 1 (you cannot leave it). An absorbing Markov chain is a Markov chain in which it is impossible to leave some states once entered. However, this is only one of the prerequisites for a Markov chain to be an absorbing Markov chain. In order for it to be an absorbing Markov chain, all other transient states must be able to reach the absorbing state with a probability of 1. Markov chains are widely used in many fields such as finance, game theory, and genetics. However, the basis of this tutorial is how to use them to model the length of a company's sales process since this could be a Markov process. This was in fact validated by testing if sequences are detailing the steps that a deal went through before successfully closing complied with the Markov property. This analysis carried the assumption that the probabilities of a given deal moving forward in our sales process was constant from month to month for a given industry in order to use time-homogenous Markov chains. That is a Markov chain in which the transition probabilities between states stayed constant as time went on (the number of steps k increased). The probability of a deal moving from our sales representative stages to our account execute stages vs. staying on them for a given month. The probability of a deal moving from our account executive stages to a successfully closed deal vs. staying in them for a given month. The probability of staying in a successfully closed deal, which was 1. Therefore, making closed an absorbing state. This analysis was conducted using the R programming language. R has a handy package called a Markov Chain that can handle a vast array of Markov chain types. Since the p-value shown is above 0.05, we do not reject the null hypothesis that the sequence follows the Markov property. Once that was verified, we plotted the Markov chain structure along with the transition probabilities that were derived from our data. This code instantiates a Markov chain object by defining the transition matrix as well as the names of the states. 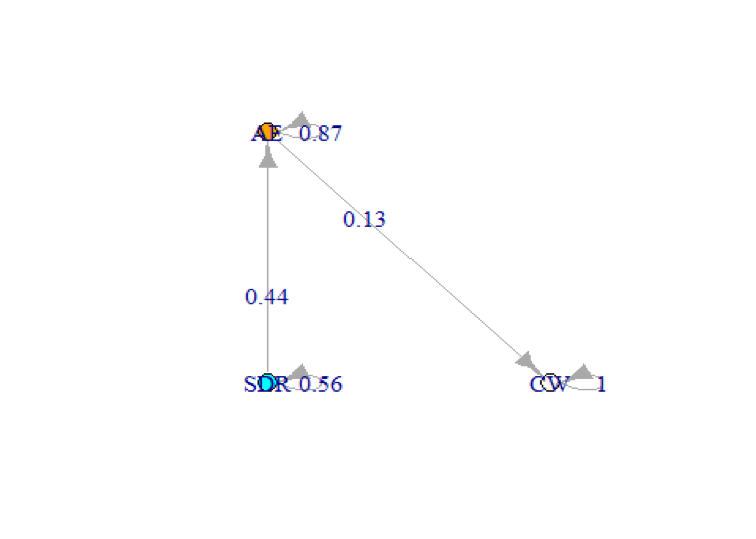 It also displays the Markov chain and the transition probabilities. Since we have an absorbing Markov chain, we calculate the expected time until absorption. The first entry of the vector will output the expected number of steps until closing from the SDR funnel while the second entry will output the expected number if we started from the AE funnel. 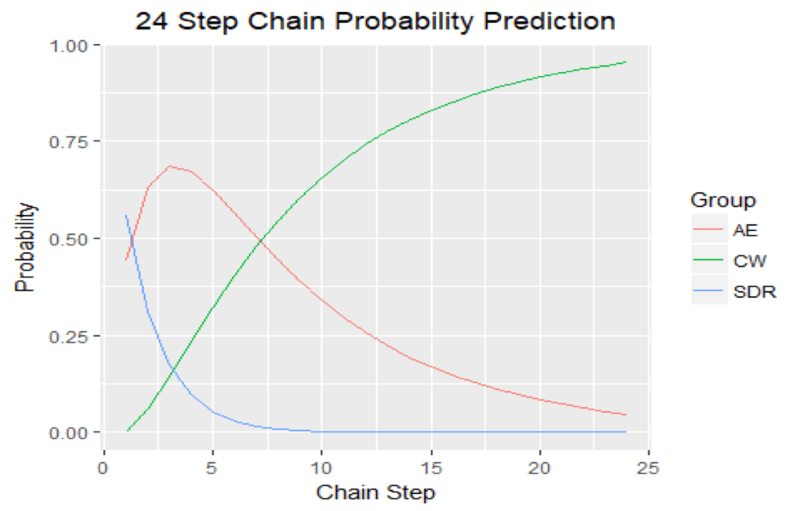 However, we can also visualize how the probabilities change as the number of steps increases to contrast the expected number of steps. Thus, we also checked the probabilities of a deal being in any of the three stages for 24 steps. # Calculate probabilities for 24 steps. If we combine both results, it seems apparent that the CW state becomes the most likely state after 6-9 steps. Given that the transition porbabilities are monthly transition probabilities, you can argue that the typical sales velocity from initial appointment set to successfully closing a deal for that industry can be between 6 and 9 months. That's quite a lengthy sales process. The goal of this analysis was to show how can the basic principles of Markov chains and absorbing Markov chains could be used to answer a question relevant to business. In this case, the Markov chain results were quite accurate despite the time-homogeneous assumptions since further empirical analyses revealed that the average sales velocity for industry used in this analysis was 208 days, which is almost 7 months. Hopefully, this example will serve for you to further explore Markov chains on your own and apply them to your business questions. If you are interested in learning more about R, take DataCamp's Intermediate R course.